Today I get a new look for BBJ/work, which will ripple through the rest of the site once I have the time. I broke one of my own rules [which are made to be broken, after all], in that I designed it, but didn’t code it myself – instead my massive thanks goes to Tom for coding up my spiffing new template for kicks, and an Alias boxset. 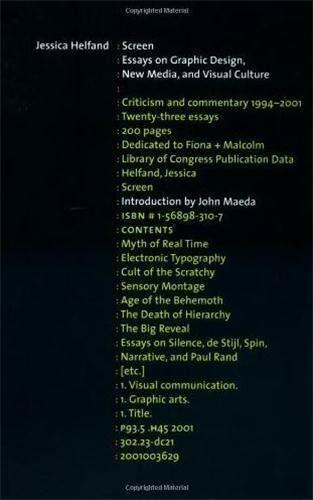 The design is massively influenced by Jessica Helfand and Bill Drenttel‘s work, specifically the jacket design for Jessica’s book of essays on information and interaction design: “Screen”. I dig those cartoony introduction to quantum mechanics and old norse books however. Via Victor. Worth a read, if you believe discussion of a culture can’t be made without discussion of it’s tools. “I watch every day what you are doing as a society. While you sit by and watch your Constitution being torn away from you, you willfully eat poisoned food, buy manufactured products no one needs and turn an uncaring eye away from millions of people suffering and dying all around you. Is this the “Universal Law” you subscribe to? TV people think TV is dead. [scenario] 5 Death of linear TV: Broadband internet and personal video recorders (PVRs) grow rapidly and films and sports become available online causing broadband penetration to reach 35% and undermining pay TV. PVRs in 35% of homes mean that viewers watch 40% of programmes at different times and skip the ads. » MediaGuardian: The end for who? MIT Technology Review has named Martin Wattenburg (see my fanboy post here) one of it’s 2003 Top 100 innovators with the citation “Simplifies peoples electronic lives with graphical data management “. Watched “Run Lola Run” on tv on Sunday. I’ve always thought RLR was loads of fun, and one of the great bits of city-cinema. Lots of the maguffinalia of RLR wouldn’t stand now: the boyfriend in the phonebox, running to plead with Dad, the incommunicado gangster. Made in 1998, how would it be restructured now? Around smartmobs, camphones, and information-infused cities? My first thought is Lola broadcast-texting all her low-life mates to shake down every tramp in a two mile radius of her boyfriend’s GPS location… Maybe coaxing a few mobs into life in the city to slow down the hoodlums… Would it be nearly as much fun to watch? RLR is a pretty short and sweet film as it is. The “accelerated urban metabolism” might mean it was all over in 15 minutes!